Designing the perfect guest bathroom is easier than you think. There are a variety of ways that we greet our guests when they come to our home. In fact, overnight guests typically require more attention than others. As such, you want to ensure that your overnight guests are comfortable and able to sleep easily by having a luxurious guest bathroom available. More often than not, guests need a bathroom where they can easily place their toothbrush, toothpaste, and other toiletries. Therefore, it’s important to take some time to update your guest bathroom so that it becomes a place that your guests feel relaxed and able to comfortably get ready for the day. Just like any remodeling project, you want to make sure that you have a clean and working toilet and shower. In fact, you may want to invest in a high-quality shower head so your guests get a sense of luxury as they get ready for their day. In addition, if you have the space for a bathtub, indulge your guests with a comfortable escape that they can use at their leisure. Also, you will want to have a vanity for your guests to use with an indulgent countertop that leaves them with space to place some of their essentials. Furthermore, you will need to have a sink and a mirror so that your guests feel right at home. Most often, guests will need very little storage compared to your master bath. In fact, guests simply require enough items to last them through their stay. Furthermore, guests typically don’t want to go through any odds and ends you may have stored in the guest bathroom. Therefore, it’s best to not keep any unnecessary items in your guest bathroom. Think about the style that you want in your guest bathroom. Ideally, you want the style of your guest bathroom to complement the style of your entire home. In fact, guests will typically vary in their style, so it’s ideal to go for a simple style that both you and your guests can enjoy. Since 1993, Elite Kitchens has been the premiere remodeling company for the DC Metro area. We’re your source for quality, brand-name European cabinetry, including the highly-rated Leicht brand cabinetry. We can help you every step of the way, with trained, in-house designers to high-class cabinetry to experienced installers. We take strides to maintain our excellent reputation by putting an emphasis on the quality of our products and the care of our services for each and every client. This is why we’re a “word of mouth” company. No advertisements, no frills, just old-fashioned, quality craftsmanship. That’s what makes us “The Recommended Kitchen and Bathroom Remodeler”! 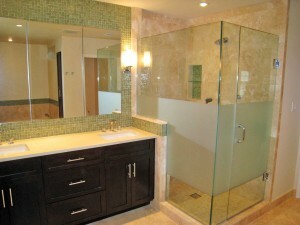 Considering us for your kitchen or bathroom remodel? Contact us by calling 301-881-2776 or by visiting our website. Have you had a good experience with Elite Kitchens? Help spread the word by liking and reviewing us on Facebook! Follow us on Twitter, Google+, and Pinterest for more exciting updates! This entry was posted on Thursday, March 2nd, 2017	at 1:04 pm	. You can follow any responses to this entry through the RSS 2.0	feed. Both comments and pings are currently closed.